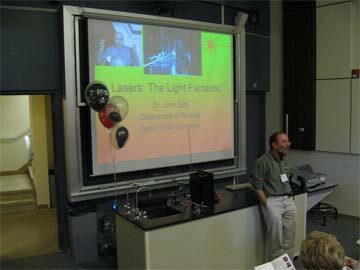 Testing the output power of an RPL-325 in the Optotronics lab (9/5/2007) This particular laser was at the time of this video was our best performing laser in stock and not typical of the "average RPL-325, which will have average sustained output of typically 330-350mW. It was show here as an RPL-325 because at the time this video was produced, the RPL-325 was the highest output model we offered. 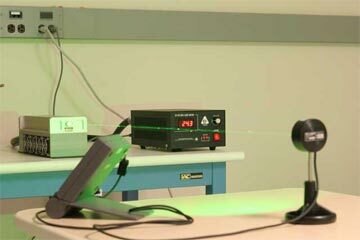 Testing the output power of an RPL-Blue-30 in the Optotronics lab. 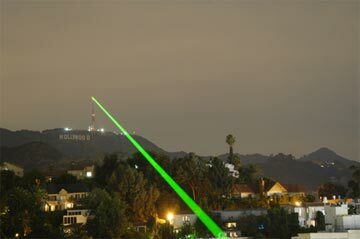 (9/7/2007) This particular laser, like the previous, was at the time of this video was our best performing RPL-Blue laser in stock and not typical of the "average" RPL-Blue-30, which will have average sustained output of typically 31-35mW. It was show here as an RPL-Blue-30 because at the time this video was produced, the RPL-Blue-30 was the highest output model we offered. Video by Carter Haines (Popping 20 balloons in a row w/ RPL-300). 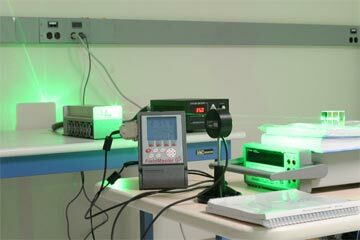 Final testing & certification of 5 Watt 532nm laser system before shipment to it's new owner. 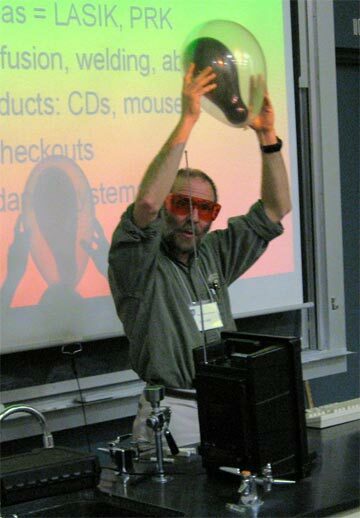 Testing of pointing stability at 3 Watt power point. Testing max. power output of +5 Watts, diode current is 35 Amps. 30mm beam splitter is needed as the thermal sensor is only rated to 3Watts. Same as previous, but showing meter reading of 2.54 Watts. 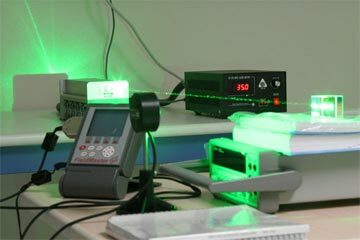 Beam splitter is 60/40 with 40% to the meter, so true output is 6.35 Watts. 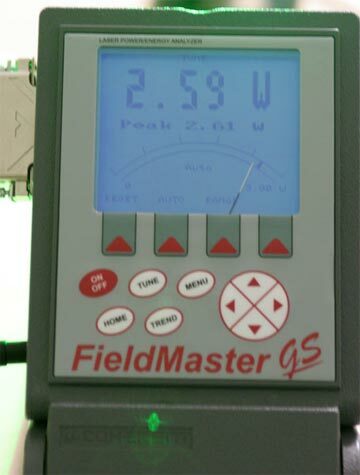 FieldMaster GS meter in tuning mode shows output of 2.59 Watts and peak reading of 2.61 Watts. 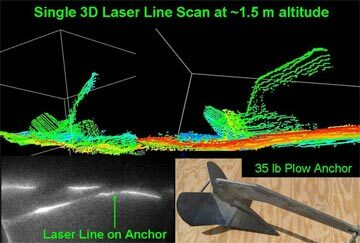 This photo was taken before the beam splitter during the testing process. 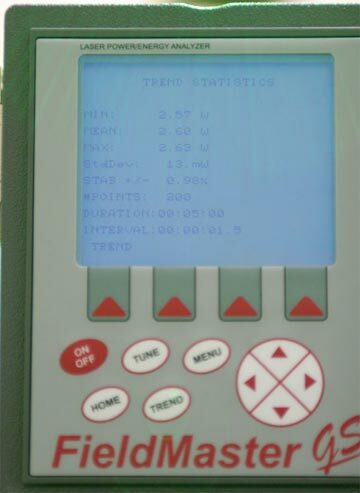 FieldMaster GS meter in statistics mode shows output stability of 0.98% over a 5 minute sample period along with min=2.57W, mean=2.60W, max=2.63W Std Dev=13mW. Data sampled at 1.5 second intervals. 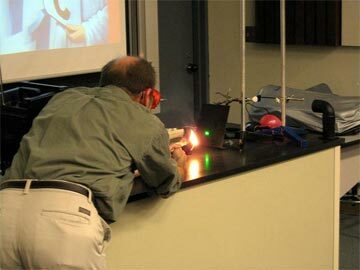 This photo was taken before the beam splitter during the testing process. Any images posted in this gallery remain the property of their original copyright owners.